Unbreakable Kimmy Schmidt might be gone, but her cheerful legacy will live on in the form of a children’s novel. 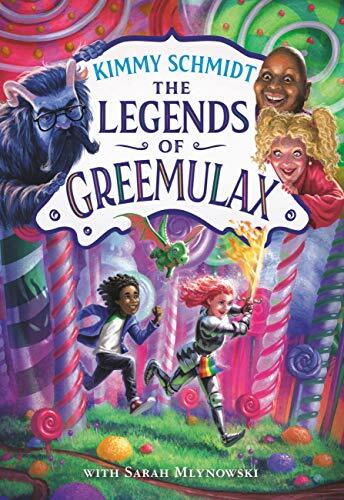 Little, Brown Books has announced that The Legends Of Greemulax, the fictional book that Kimmy writes near the end of the series, will become an actual children’s book. It tells the story of a boy and a girl who live in a magical world and must go on an epic journey to rewrite the rules of the land so both men and women can be equal again. The book strives to teach young children about sexism and equality and will be released in April, which is also Child Abuse Prevention Month. NBCUniversal announced that they would be making a donation in support of Prevent Child Abuse America in recognition of the book’s release. The book will be co-written by children’s author Sarah Mlynowski. It is available for pre-order now. We always equate Harry Potter to the lightning bolt scar that we see on his forehead. Now, a new theory emerges from a Twitter account saying the scar on his forehead may be something else, that it may be the hand motion when casting the Avada Kedavra spell. 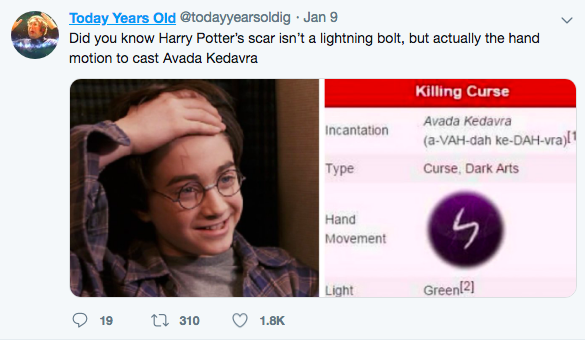 According to Her, this creates conversations amongst fans and debates about whether they agree or disagree with this theory, or whether they can come to terms, or conclusions, that it may be both a lightning bolt and the curse.After all, the Avada Kedavra spell does resemble lightening when cast. Here is some of our favorite childhood book series…part 2!